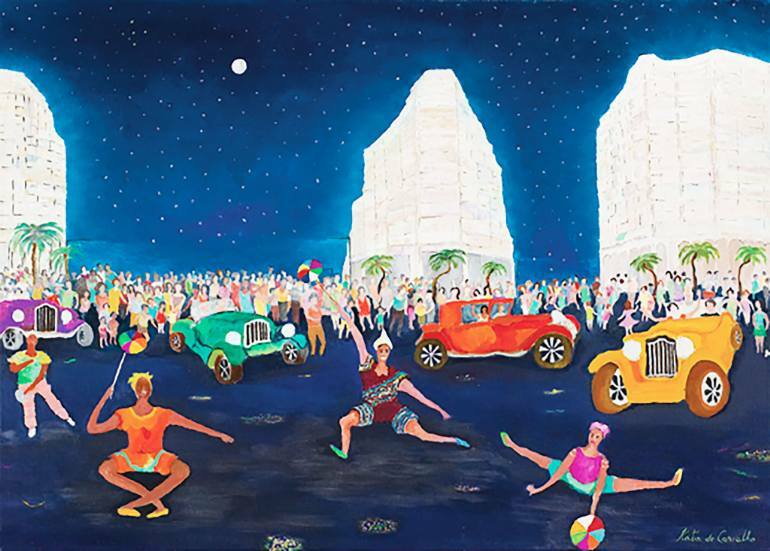 Art Synergy in collaboration with Art Palm Beach produces more than 65 exhibitions throughout the nine Palm Beach County Art Districts. Art Synergy is a Palm Beach countywide movement to unify and promote the diverse culture of their vibrant arts community. Four years ago in early 2013, with the help (and at the urging of) nationally known artist / activist Frank Basta Jr., Craig McInnis and Rolando Barrero (local artists and activists themselves) created a think tank. Dedicated to finding solutions instead of dwelling on problems, the think tank was a forum for local artists of all kinds to come together and discuss ideas to help the local scene grow. 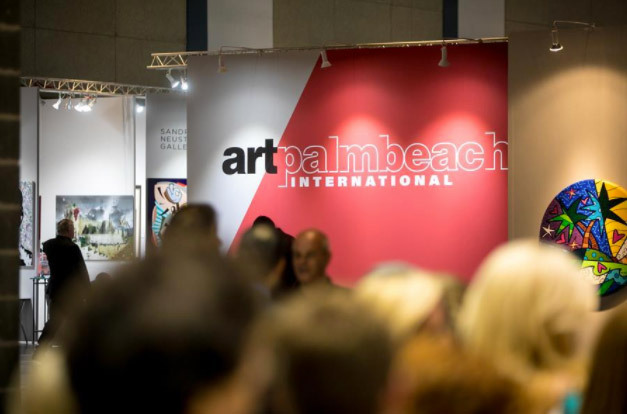 The first initiative they tackled was a program of events to coincide with Art Palm Beach; in hopes that the local scene could benefit from the popular art event much like Miami has benefitted from Art Basel. Soon it was named ART SYNERGY and everything took shape. 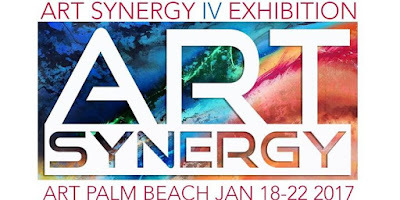 ART SYNERGY’s future goals include events that will happen periodically throughout the year, the addition of more participating art districts, and initiatives that help unify the many diverse art entities, and talented artists that Palm Beach County has to offer. With the help of local CRAs, Public Arts Departments, the DDA in WPB and the Cultural Council of Palm Beach county (to name a few), ART SYNERGY has only one place to go… onward and upward. Acquiring new collectors was ranked as the #1 of the "Top Five Business Concerns" of dealers in TEFAF's 2017 annual art market report. Acquiring new collectors was ranked as the #1 of the "Top Five Business Concerns" of dealers in TEFAF's 2017 annual art market report. Over 71.8% of the dealers responded that their main concern was the cost of acquiring new clients and 43.07 % responded maintaining and managing existing clients ranked 5th in the survey. Overall the 2017 report showed that the gallery market saw a positive growth in 2016 with private dealer sales up 24%. Good news, dealer sales make up over 62% of the global $45 billion art market and growth is expected to continue throughout 2018. Where do you expect to meet new and prospective collectors? "Art and trade fairs are the most important platform...dealers answered that they meet 20% - 70% of their new and prospective buyers at art fairs. 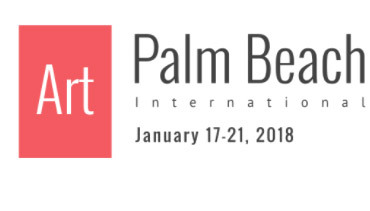 Next Level Fairs, an industry leader for over 28 years, will offer its 2018 exhibitors a full range of web and digital marketing services to increase dealer's return on fair investment, increase collector retention, and reduce fair participation expenses. Next Level Fairs will also partner with its exhibitors to provide a more robust web presence for our dealers and their artists. Exhibitors will be offered a full range of software from state of the art CRM database management; dynamic web design; digital marketing strategy planning and real time analytical analysis of website activity, and access to leading art historians and critics for art content writing projects. 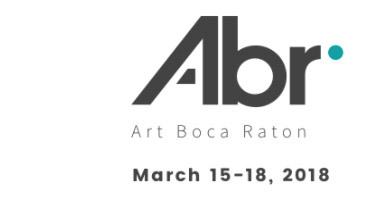 Interested in learning more about participating in the 21st edition of ArtPalmBeach and Art Boca Raton? 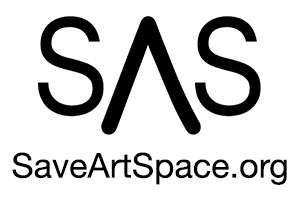 The SaveArtSpace: Your Art New York Selected Artist is Ken Lavey of Allendale, NJ! Ken's work will be on display on advertisement space starting August 7 in New York City! The exact address will be announced in the coming days. You can learn more about Ken at saveartspace.org/youartnewyork. This work was selected by special guest curator Efrem Zelony-Mindell. Elise Peterson, Lissa Rivera, Beth Brown, Sara Meadows, Nina Summer, Allie Kelley, Jess Whittam, Fanny Allie, Monica Felix, and Julie Orlick. Brooklyn-based nonprofit organization SaveArtSpace is proud to present its latest initiative "SaveArtSpace: The Future Is Female" an all-woman gallery & public art exhibition. Inspired by today's feminist rallying cry which was first coined by the lesbian separatists of the 1970s, the exhibition aims to explore and celebrate the ever-evolving intersectional feminist movement, while redefining and expanding upon the mainstream definition of "the female gaze". 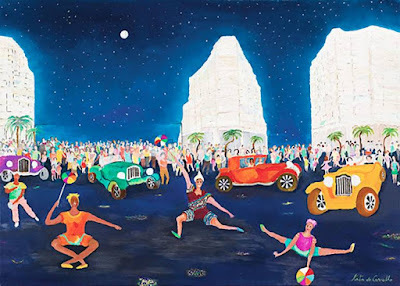 Switzerland-based painter Katia de Carvalho is an internationally recognized artist known for her dreamy landscapes and scenic images that give the viewer a colorful glimpse into the moments being captured through her work. ‘Carnival Parade’, oil on canvas, 20 x 28 inches. The artist paints vivid urban and rural scenes of everyday life, from people dancing in the night, a distant farm in the hills, to ladies doing laundry by the shore. 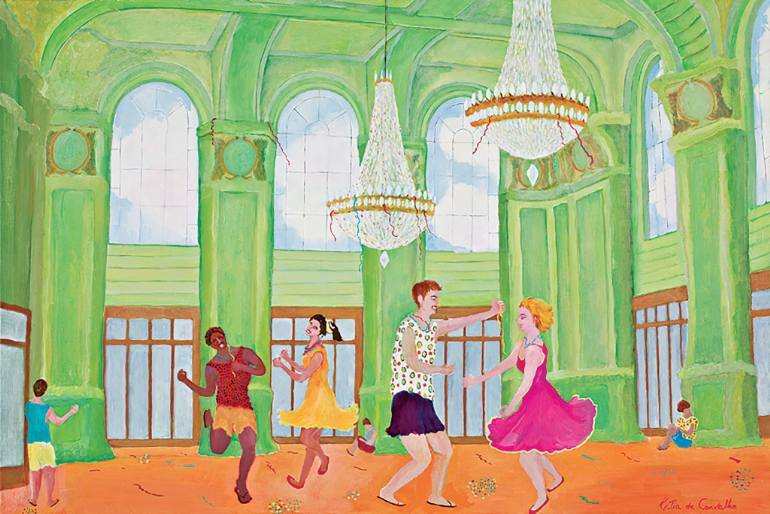 ‘End of Carnival Ball’, oil on canvas, 21 x 31 inches. Each painting shares a little slice of day-to-day life with an innocent style reminiscent of the Naive art genre, which is what makes the work interesting, having a unique expression of perspective and color. Much of Katia’s early works were dedicated to Venice, portraying the waterways and the facades of the buildings hanging like sheets between the air and the water. Her timeless vision of everyday life bares the child-like ruminations of her heart and soul as with most self-taught artists who strive to relate – by means of brush, paint and canvas – the fairy tale figments of their fertile imaginations. 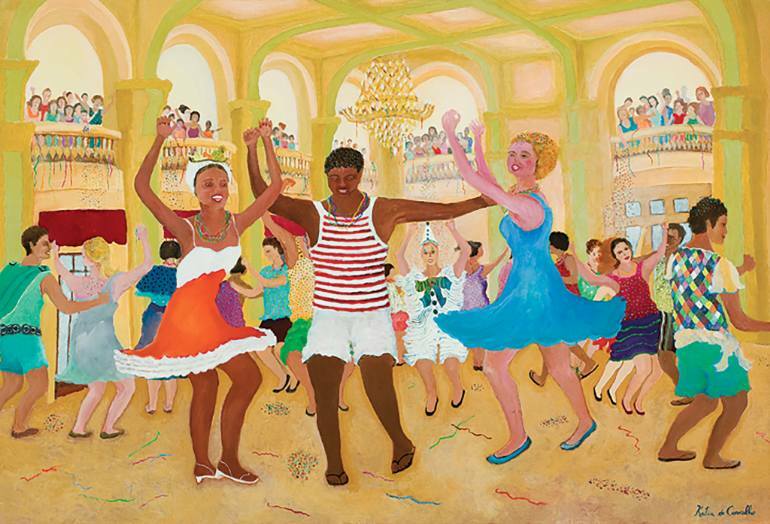 ‘The Three Dancers’, oil on canvas, 26 x 39 inches. Genuine naive artists are hard to come by; however, one runs across the real thing occasionally, and Katia de Carvalho is one of them. 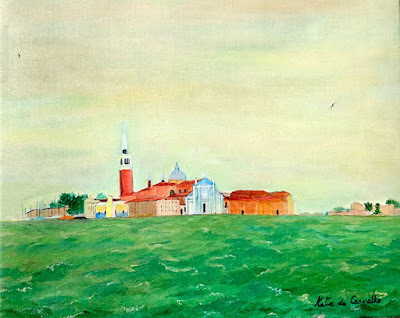 There is such a disarming candor in the simplicity of approach, and such a guileless directness in feeling, that one cannot help being enchanted by these paintings. 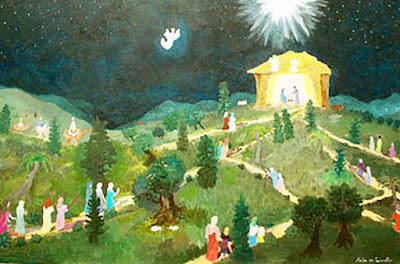 ‘Nativity’, oil on canvas, 24 x 32 inches.